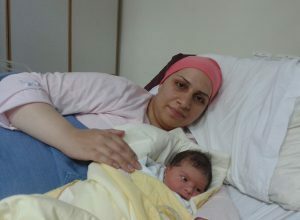 Fatmeh, 28, sits comfortably in her pink sweat suit in the middle of her bed at Holy Family Hospital where she has come in for observation for the second time in her third pregnancy. 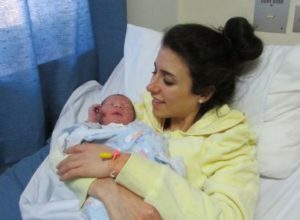 She is now six months pregnant and experienced some bleeding four days ago, so she came to the hospital from the Bedouin desert village of Rashaydeh. In a private car, if one is lucky with the traffic, the ride from her village to Bethlehem can take just over an hour. Using public transportation to come to the hospital can add another hour of travel time. Very few people in the village have private cars. The mother of two young children, Fatmeh has never been to school and her husband, Mohammed, 30, finished elementary school. He is now a laborer and because of a skin disease on his hand, is unable to work steadily to support his family. For the women of her village the Holy Family Hospital’s mobile outreach clinic where Fatmeh has been receiving her prenatal care is a blessing, Fatmeh said, reflecting on the difference between her pregnancies and her mother’s pregnancies. “My mother delivered all eight of her babies at home. For me, it is now much safer because I can give birth at Holy Family Hospital where I can get proper medical treatment and my babies can be taken care of if there is an emergency,” she says. Today all the woman in the village are aware of the importance of proper prenatal care, and when the Mobile Clinic comes for its weekly visit to the village, the pregnant women come for their checkups, she said. But still, she said, she is concerned about being able to pay for the hospitalization bill. Her village at the outskirts of the desert is a poor one, with many of the men unemployed or employed at minimum wage work. 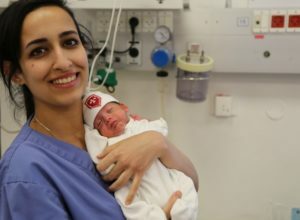 She and her husband had not planned on two hospital stays before she delivered their baby and the added financial burden of those extra expenses weighs heavily on Fatmeh’s mind. Hospital social worker Mary Maoh noted that Mohammed was able to work for a few days and earned enough money to pay for the first hospital stay, which he insisted they pay in full although it was difficult for them. Now with the second stay, he is unable to put together enough money to pay for the bill, she said. They have UNRWA cards, which means the United Nations refugee organization will be able to pay for part of the hospitalization. Thanks to the generous donations of Holy Family Hospital supporters, said Maoh, she will be able to help the couple with the rest of the bill when Fatmeh is discharged from the hospital. “I know the desert and how hard the life is there,” said Mary Maoh, the social worker.